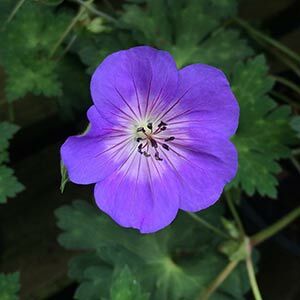 Any plant that has been awarded ‘Perennial of the year’ has to be worth a look, and Geranium ‘Rozanne’ lives up to its reputation. It has also been awarded plant of the decade as well as a few other acclamations, and it is readily available for sale in Australia. The brilliant violet blue flowers might not be extremely large, however they do get to a good size up to 6cm across, and they do appear in profusion. Geranium ‘Rozanne’ is also blessed with a long flowering season and an easy care nature. For us the flowers commence in late spring and continue through to early winter, in Sydney it will flower almost year round. This is a hybrid between G. wallichianum and G. himalayense, as are a few others, however Geranium ‘Rozanne’ is better than most, if not all. Excellent at the front of the garden border as this is a low growing plant.Also useful for growing in containers. Mix it up with other plants of similar height to form a patchwork quilt of colour. Excellent for underplanting taller plants including roses, or plant it next to grey foliage plants to add some contrast. Mulch around ‘Geranium ‘Rozanne’ top maintain a cool moist root run. After planting, water regularly with a liquid seaweed fertiliser to help with root establishment. Water deeply through the first summer if soil begins to dry. Soil – Humus rich, moist but well drained. Flower colour – Violet Blue with a white eye, petals lightly veined with a crimson streak. Flowering period – Early summer through to autumn. Flowering will be longer in a cool position. Foliage – Deep green, deeply lobbed. Growth rate is regarded as medium to fast. Pruning . After the first flush of flowers, Geranium ‘Rozanne’ can be pruned back to promote a second flush of flowers later in the season. Prune back hard in spring as new growth commences. Propagation – Only by cuttings or division. Where can you buy ‘Geranium ‘Rozanne’ ?